I believe there's more to the Journey. There's far more to life. We just need to take the time to search for it. Travel along as we, together, chip away at the rocks and debris of Life to discover the Diamonds of Truth in the Everyday that are waiting to be found. 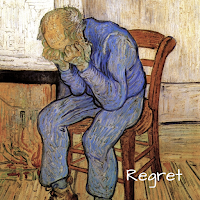 I've been reflecting a lot on the word Regret. Ever looked at it closely? Ever experience it? I have...I carry Regret with me every day. I Regret things I chose or things I didn't choose, decisions I made that if given the opportunity I would have made a different choice. But doing a quick definition look-up I was struck with what's hidden in this oft-used word - the word Greet. To re-greet a circumstance with kindness, as one would greet an old friend, all of a sudden changes the nuance of the word Regret. 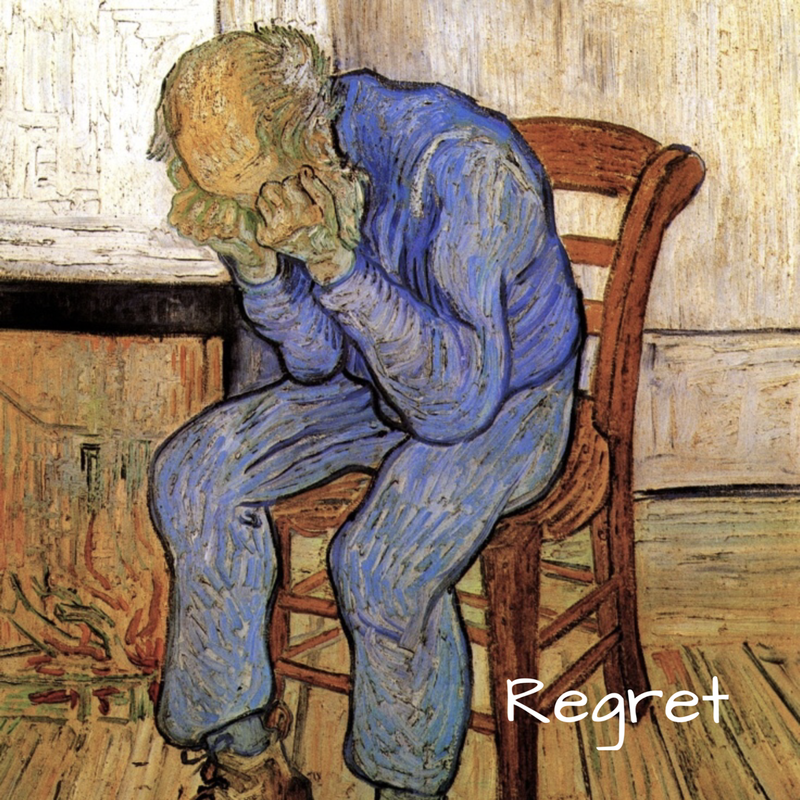 As I have had to re-greet my life's Regrets, I have been surprised by the lessons; I have found them not to be times in my life to welcome despair (glass half-full/empty stuff) but to sincerely look at them square in the face and ask, 'What can I learn from you? Why has this been allowed? How can I grow in this circumstance?' So...here I am today - filled with hope and wonder. I have chosen to greet my Regrets as long-lost friends who have made me who I am today and they have become my 'regreets' of lessons learned and the journey yet to be discovered...In my life thus far, I have had innumerable lessons that have been difficult, to say the least, to walk through. But looking forward, today, and whatever this week brings, I greet these lessons from afar and run towards them with great anticipation of what they can teach me about Love, Faith, Hope...and many, many more things. To regret kills. To re-greet restores. Please excuse what may be perceived as a rant...but this question has been on my mind for a while…What IS church? 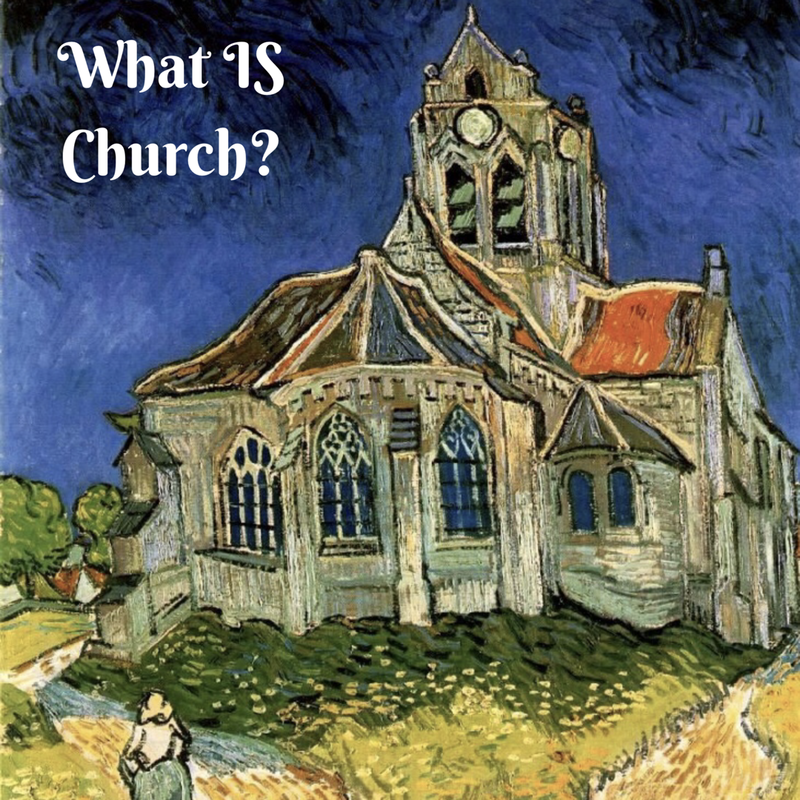 Or maybe a better way of shaping the question, What is THE Church? First, I’m a Christian...better defined, I'm a follower of Jesus, who's life is described in the 'Gospel accounts' (the books of Matthew, Mark, Luke and John) in the Bible. Second, when I use the term Church, I’m intentionally using a capital ‘C’ as I very much believe that it (or better described, she; see Eph. 5:25) is a representation of what God the Father imagined and built through the people that desired to confessing their need of Him in their lives. And thirdly, I ask this question, What is the Church?, because I believe we’ve failed God. I believe His desire was to build a community of people (which he named The Church) characterised as recklessly abandoned to loving Him and loving everyone else in their world, regardless of the choices they’d made or circumstances they found themselves in - especially if the world regarded them as 'sinners - these people would be welcome and loved within the arms of the Church, mirroring God's love for them. I confess those are a lot of words, so I am going to tread very carefully as I write this post, but I truly believe there needs to be a radical change in mindset for those who say they are followers of Jesus Christ. Perhaps it is best to begin by sharing a little bit of my story in hopes in sharing it would give you a better handle on what I have personally experienced in my life, especially within the last few years, and why I've come to this conclusion. I was born into a Christian home. I was taught to believe everything that’s in the Bible. I was taught to embrace and love people no matter what race or heritage or circumstances they found themselves in. The one that I have learned this the most from was my father. While he was living he took it upon himself to make sure that every person in whom he came in contact with knew that they were loved and special. My family has many, many stories of how he would interact with people of other cultures and races; he would consistently approach them again and again because he believed that they were special and he believed that they were worth the time to get to know, to get to understand their story and he in turn would be enriched because he was taking the time to get to know these people. I believe my Pop believed everything in the Bible and I believe that his personal life-vision came out of the study of the Bible (aka God's heart for people). He was one of the best examples of the Christian faith-walk that I’ve had the privilege to learn from. Sure, like all of us, he had his faults, but at the end of the day he truly desired to love people. I have very fond recollection of sitting at his bedside as he was literally slipping from my hands into the hands of his Creator and hearing that he desired to speak more love into peoples lives, desiring to share with more people the love that he’d found in Jesus Christ. It literally was his dying wish to share more love with people in telling them about Jesus. Somewhere along the way, though, I was taught to not associate with 'sinners'. This teaching truly was not taught my my Pop, but somewhere, somehow, I was not only taught how to label who these 'sinners' were in my world, but I was also taught to stay far, far away from them; to use an Old Testament word, I was taught to 'shun' them. I grew up, comfortable in my own surroundings, disassociating myself with those on the 'outside'. I would see them in the streets, in my classroom, etc. but no never would I think to approach them, let alone get to know them or worse love them! I look back on this now and I see how harsh a reality this was. Somehow there was a disconnect from the stories I would read in the Bible of how Jesus talked with these people labelled as 'sinners' in his society. And he taught his disciples to do the same. But somehow, they were just stories and I, a proud follower of Jesus, stayed clear from these 'people' - I did not emulate the teachings of Jesus. Somehow, someway, the clearest teaching of Jesus I did not learn. In part, I believe I need to write this post because in a lot of my interactions with people who say they are followers of Jesus Christ, they simply do not line up with what my dad lived his life for and what I've just described as Jesus' teaching to love 'sinners'. I can recognise this because I did it myself; I have been a part of this lifestyle for far too long. So, please don't try to find an accusatory finger-point in this post because that is not what I am doing. I am far too aware that these words cut deep into my own words and actions. The truth is, my dad lived his life to love people - to care for them and to let them know from the bottom of his heart that he cared deeply for them and wanted them to know how special he thought they were. He chose to build people up and communicated that so graciously. As I mentioned, he had his faults, but one thing that I know that he always tried to do: he always tried to help and encourage. He always wanted people to know that they were loved. I would love to tell you that I have experienced that same love across the board in the Christian community, but I haven't. I know there are two sides to every story, but words are the most deadliest of weapons - not because we know how to use them but because we don’t. Imagine the most deadliest of weapons in the hands of an inexperienced fighter and that image comes close to what I'm trying to describe here. We hurt and sometimes even kill with our words, yet our actions are even more damaging. 'Friendly fire' is at an all-time high in our communities; worse, we hurt and wound our wounded. I believe it needs to stop. Now, the real guts of the post: I don’t believe that we, as the Church, have represented Christ well in how we have interacted with the rest of society. Be it the gay and lesbian community, the low-income bracket, the high-income bracket, the divorced, the drug-addicts...the list goes on. I read in the Gospels of a man by the name of Jesus who willingly sat with the marginalised and ‘sinners’ of the day. He was criticised for it and, eventually, was murdered because he said he was acting as a perfect example of God (going as far as to say he was God). So here’s the thing: Regardless of whether you believe Jesus Christ is the Son of God or not, he believed he was acting as the representative of God in the community. As he made it known he was representing God in the community, he intentionally sat and interacted with the marginalised and poor and sinners. If we, desiring to follow after that example, do not seek to include or make welcome and embrace with love those of our community that Jesus would label as ‘sinners’ in our day, logic tells me we are not true followers of Jesus. Worse, we are defaming Jesus’ name. I believe the four Gospels give us the best example of how God wants us to be the Church and the rest of the Bible (and all the way up to the present-day for that matter), is filled with examples of how we’ve failed at being the Church that God really wanted us to be. These are harsh words I know. But I know, as humbly as I can say it, the words that I have chosen to say here are true. Talk to the marginalised. Hear what they have to say. Blood is literally on our hands because of those in our community who have felt unwelcome (and by default, unloved) by people within the church groups who claim to say they are followers of Jesus Christ but are not living up to that name. Love is definitely not the first words out of the mouths of 'sinners' when they speak of the Church. I believe we have literally constructed 'churches' but shut the doors tight. We have not become the Church that God has wanted us to be. Rather than these gatherings be loving, welcoming and inclusive, they have quickly become exclusive clubs that require membership. I once read that the doors of church buildings remain open, not for people to come in but for the people within its walls to go out! Jesus taught his disciples that the people that they lived with would know that they had been around him by how they loved each other. He simply said the people would know they were followers of his by how they love; it was their love that would show true followership in Jesus Christ (John 13:35). As cynical as this sounds, you could make the case that Jesus' followers did their jobs - they loved each other - patting each other on the back and huddling together in a 'holy huddle', they could celebrate how closely knit they were in love; not unlike what we do today. But was this what Jesus was asking them to do? But where was Jesus? Where is Jesus now? As we continue to create our 'holy huddles, Jesus is at the sinner's house, he's eating with those tax-collectors again (Mark 2:15). He's socialising with the outcast of his day (John 4). He's kneeling in front of an adulterous woman and saving her from being killed (John 8:1). I do not believe it a leap at all to say that with that love that Jesus was speaking of, he was showing by his own actions what he was expecting his followers to do. And, just as his disciples missed the mark, I believe the Church (the people who say they believe in Jesus) today have missed the mark as well. Badly. Something needs to change. Something very radical needs to happen to the groups of people who gather together in our communities that have 'church' in their name, who sing together, pray together and read the Bible together. I believe very strongly that the Church that was destined to be in the mind of God has failed. We need to re-read the Bible and change our mindset and ways of interacting with the communities we live in. For Jesus’ namesake. As the Church, we need to love. As Jesus loved. That way, the world would know we are following him and in turn, will want to follow him as well. *I have intentionally left out probably one of the most clearest lessons that we find in the Bible. When people met together they called themselves the Church. 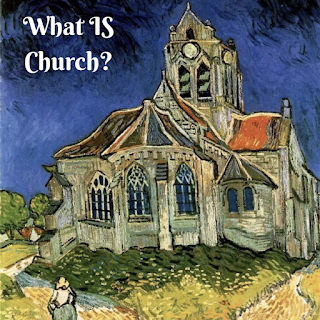 Nowhere in the Bible is there any definition of the 'church' being a building. Perhaps that’s a different post but I very much believe that we need to even change our vocabularies to not include statements such as “I’m going to church”. We need to BE the Church; we don’t GO to church. As I reflected on this painting simply entitled The Sower by Vincent van Gogh, I believe I've come to know a bit more about sowing and the processes that we can discover. It's not as simple as it looks. Every farmer will tell you that there needs to be just the right weather and temperature to plant your seed. You need just the right time of day. Plant too early, you destroy your crop. Plant too late, you don't reap what you should have. But in the start of this discussion, there's the part that no farmer takes lightly - it's the waiting. Plant late, early, or on time - you still need to wait. Every. Single. Moment. You can't rush the 'reap'. You must respect The Reap - the Harvest will come, but you must wait. So, at the risk of slowing right down to a dull roar (to unashamedly make a point), each of these aspects must be respected. You cannot rush the process. You must wait! One thing's for sure, though. There's a healthy respect for The Seed too. But it's kind of odd. We respect The Seed by throwing it away. Things we respect we cherish, maybe even hide away, and, if people are lucky, we bring them out for Show and Tell on special occasions, but, just as quickly, we hide them away again, allowing our treasured items to collect more than dust on our shelves. And these items may not just be physical things - they could very well be items on our hearts - memories, emotions, bits of ourselves that we dare not show the world for fear of rejection. So I do acknowledge that it is a bit odd that The Sower throws away the most cherished thing in this picture of The Sower, but as he waits, he knows that there is something magical about to happen. It is worth the wait! To Reap a Harvest you must plant a Seed and Wait. What is the outcome? What is all the waiting about? The Harvest! The reaping of the fruit of our labours! 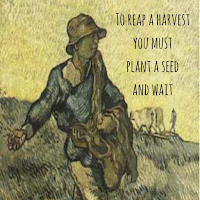 As you (un)cautiously toss your Seed to the wind, you wait, but not too long - because, in his work, a patient farmer knows - the work will be worth it! 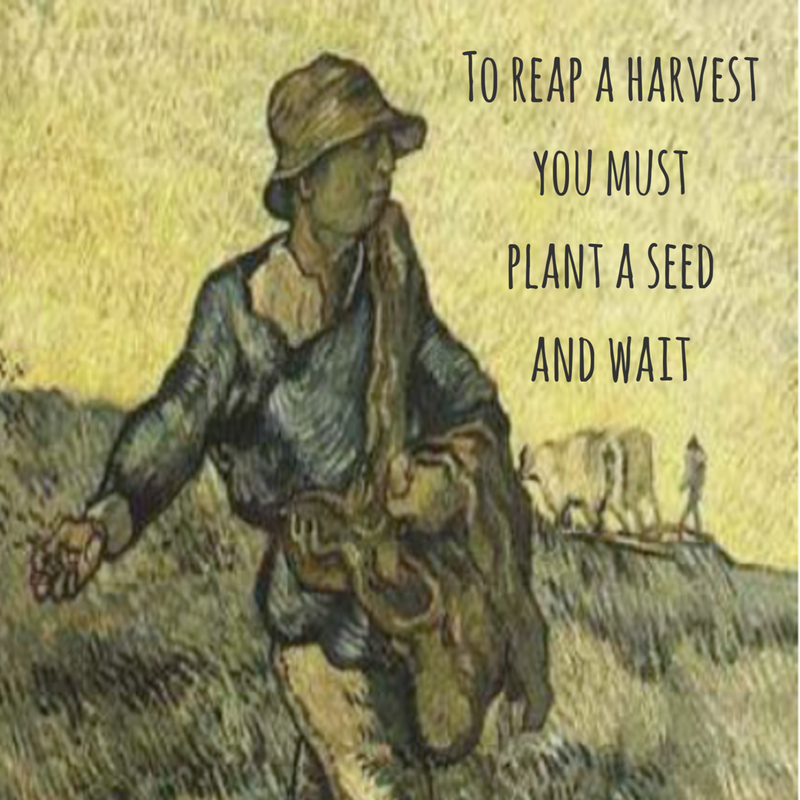 To reap a generous harvest, these steps must be done first, but oh the Harvest if we wait! What are you holding too tightly to? What's that 'seed' that you need to loosen your grip on? 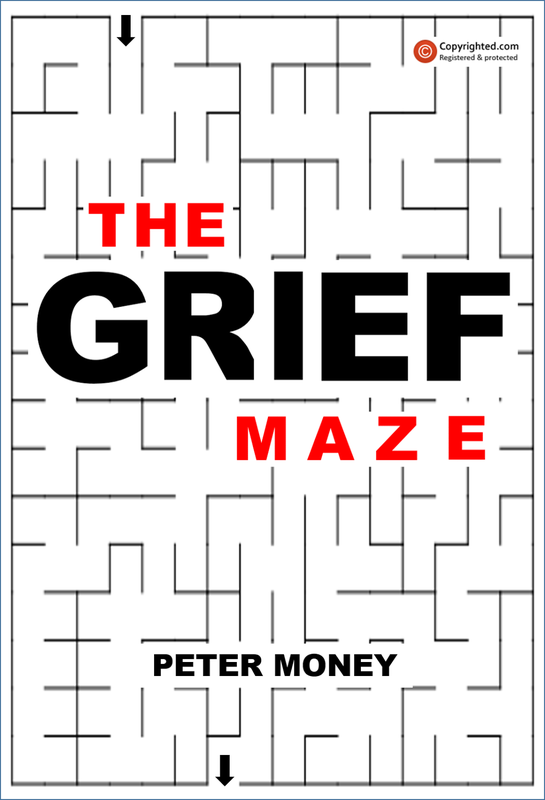 Where have you seen a conscious choice to avoid that dreaded step of waiting, because it's too painful? How can you convince yourself that The Harvest is coming and each step truly is worth it because of the great reward that awaits you, if you only see the importance of each step? Dare to Toss your cherished Seed to the Wind and Wait...because there truly is a bountiful Harvest waiting! 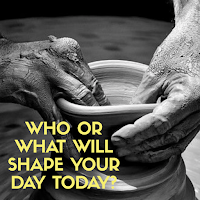 Who or What will Shape your Day Today? I believe it to be one of the most important questions that we, as people who walk this planet, need to answer...Who or What will Shape your Day Today? We can be told from a very young age that we are ugly, stupid, etc. but as we grow older, we, in our own self-conscious way, start believing these 'truths' and our world is shaped around these beliefs (speaking as someone who has battled with this most of my life). I start believing this 'truth'. More specifically, I start living my life with the implications of this 'truth'. If I believe myself to be ugly, I view the world with ugly glasses on. If you believe youself to be stupid, you view the world with stupid glasses on. Borrowing the phrase, 'You are what you eat', I believe 100% we are what we think (or hear or believe) about ourselves. But we do have a choice. So...is there hope? Is there a way to be free from these bindings that seem to be so tightly wrapped around us in our lives? Can we be free from being shaped harmfully from the deceptive lies that so often slither their way into our minds and hearts? I believe we can. But it's going to take a lot of work. But at the same time, this work that I speak of is the most simplest thing we could ever do. Get up. Go to a mirror. Look into the eyes of the person you see on the other side of the mirror and repeat after me: "I am not stupid. I don't have to live my life this way." "I am not ugly. I don't have to live my life this way..." Continue to speak very clearly into these things that have shaped you and how you see the world. But don't leave the mirror yet...there's another part. Face the mirror and now speak (positive) truth: "I am unique. There is no one like me. That means I'm beautiful by just being me." "I have a brain and skin and motor skills. These alone make me the most intelligent of beings on the face of the planet - I pale in comparison to many, many supposed intelligent things...that makes me intelligent!" The sad truth is, who or what will shape our days is almost completely dependent on us - but many of us don't even know it! I have so often bound myself to the habit of believing lies about myself, the world around me and the people in it, that I've forgotten, or worse, can't recognise, what Truth is, even when it's staring me square in the face! Rather than allowing Truth to shape me, I've allowed lies to take its place. And lies are never, ever fun. Lies are like friends that you don't want to play in the sandbox with. The shapes that are built are always a bit off and a bit broken; the buckets the liars use create these sand-castles that are broken and torn. 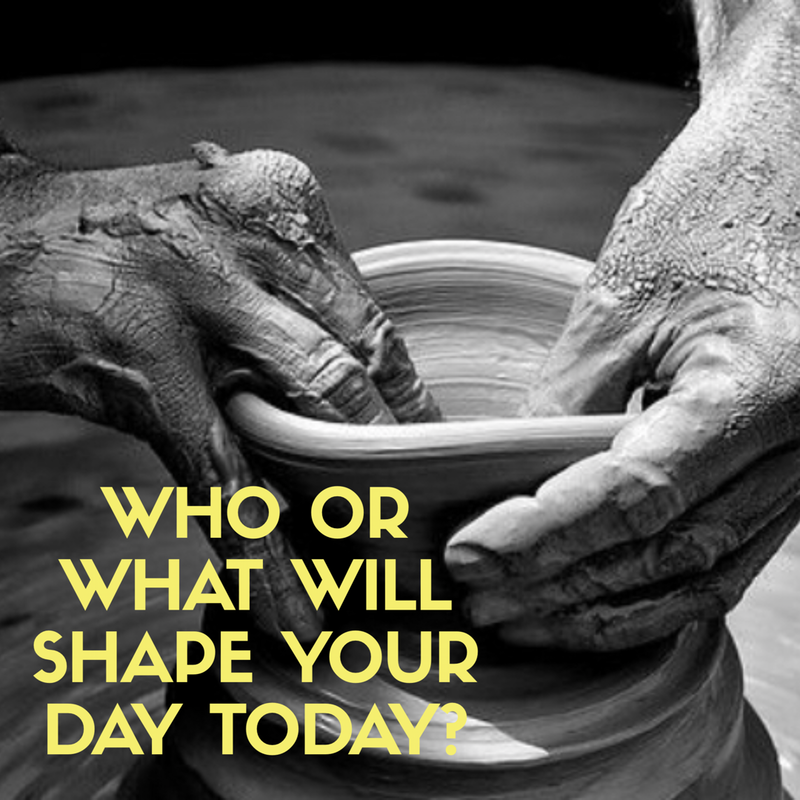 So who or what will shape your day today? You do have a choice. You can wake up tomorrow and begin to make changes that will drastically change the way you view the world. I've unashamedly quoted it before, but Michael Jackson has an incredible song called Man in the Mirror, '...If you want to make the world a better place, take a look at yourself and then make a change'. So what's the answer to the question, Who or what will shape your day today? You! Take it back! Take back what is yours to own. You shape your day today! Tell yourself the truth and make a difference - in your life and the lives of those around you. Start with who you see in the mirror. And take those dang lying-glasses off! You couldn't see clearly with them on anyway! By HIS scars we are healed...So what about our scars? Scars. I've got a few. Probably you do as well. I'm not necessarily speaking of physical scars - maybe emotional or mental as well - but we all seem to be a bit diversified on our view of our scars. Most of the time we hide them, regardless of whether they are physical or otherwise...but as I've reflected on this, I can truly say that I hear myself changing my mind when it comes to hiding my scars and learning how to use them. Think about how blessed you are when you see someone who has either a physical or emotional scar that they can't help but show, but are joyful and experiencing a joy like you haven't or aren't. It's such a blessing! I believe it is because they've chosen not to hide but actively use their scars as blessings to the world that they are who they are. I believe this is a lesson that Jesus taught that so few of us have listened to. He didn't hide his scars. In fact, He used them to both confirm Who He was but also to comfort His followers. So...if Jesus didn't hide His scars, then why are we? I believe we are missing out on a whole bunch of healing if we refrain from exposing our scars. Jesus knew that His scars would bring healing. I read somewhere that some believe that Jesus, in His physical form, had some sort of physical infirmity - similar to that of a 'hunchback'. They backed it up with the text that reads, '...he grew up before him like a young plant, and like a root out of dry ground; he had no form or majesty that we should look at him, and no beauty that we should desire him. He was despised and rejected by men, a man of sorrows and acquainted with grief; and as one from whom men hide their faces he was despised, and we esteemed him not' (Isaiah 53:2, 3). So I simply ask the question: If Jesus did have a physical infirmity, how does that change how we view Him and the ministry that He had with His disciples? What if the scars that He had weren't only after His resurrection, but also throughout His entire lifetime? How does that alter our understanding of the focus text 'by his wounds we are healed'? He displayed His scars for all to see and we have all benefited from it! Jesus also knew that Thomas' life (and the rest of the disciples' and ours) would never be the same, in His choosing to show His scars. Again, not just in His resurrected state, but also throughout His whole ministry. It is by His scars that we are healed. And if Jesus' scars healed many (and continue to do so), I believe with all my heart that He is calling each of us to the task of being healers to those around us, just as He had been and is for us today as the Great Healer, by baring our scars to heal the people around us. I've grown up in the church. I've heard all the sermons. And my life will never be the same again. But when it comes to the 'scar passages' in the Bible, I've heard the 'polite view' predominantly. We don't want to expose what's really there because of fear - fear of what we need to learn or worse, how we'd be changed - so we turn our faith-eyes and exclaim that we just need to believe without really knowing what we believe. We avoid the 'hard passages' because we believe subconsciously (or otherwise) that God couldn't do anything with the scars of peoples' lives - we need to be perfect before He can use us. But I believe there is concrete evidence that the Lord desires to teach us - in faith, for His glory - through His (and our) scars. This philosophy simply is the belief that God doesn't just use scars and pain because they're 'oopses' on His radar, but He knew that they would be there as He'd orchestrated them from the beginning. I could talk about David's scars, Abraham's gashes, Rahab's...but I'd like to focus on Jesus' scars. As the text above says, '...by [them] we are healed'. In exposing His scars, Jesus has healed many! So, if Jesus was willing to expose His scars because He saw the value in it, why aren't we exposing our scars? 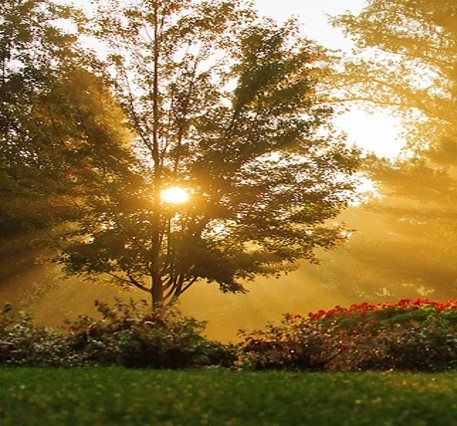 How does God the Father comfort us in our affliction? In no where else than through the scars of Jesus. Jesus' scars from the crucifixion (and, perhaps a life-long battle as shared above) literally left their mark on Him but He, in turn, desired to be the Great Healer by bearing the scars instead of hiding them. It is still curious to me that in Jesus' resurrected (aka perfected state) His scars remained. Have you ever thought of this? Instead of what we would call a 'perfect state' (aka no scars or reminders of what He lived through), Jesus' scars remained when He appeared to His followers. Why? Unless I see in his hands the mark of the nails, and place my finger into the mark of the nails, and place my hand into his side, I will never believe. I believe Thomas sincerely wanted to believe. Note that Jesus does not condemn him once He appears again because of his request (unbelievable that Jesus appears because of Thomas' request; he does teach him patience though as he didn't appear until 8 days later; see Jn. 20:27-29). The aspect of this scene that I would really like to focus on is Jesus' scars, but let's look at a bit of background first. This scene is after Jesus has risen from the dead. He's appeared to many, but His appearance may seem different to some. I'm a contrast guy so I can imagine the 'resurrected Jesus scene' far different - Him glowing, on a white horse, with a halo over his head, white linen clothing, glitter on the floor, with a sword in His hand with the inscription 'I AM', etc. - I can picture this because, ever since the actual resurrection, we have been inundated with countless interpretations of Jesus' ministry through the imaginations of artists in mediums such as sculpture and canvas. But may I suggest to you that they have all steered us in the wrong direction? There was glory. Oh boy, there was glory! But not in the way like we can imagine. I believe these artistic interpretations are far too pretty; they've hidden what was really supposed to be revealed. And, as such, we have been prohibited from seeing the real meaning of Jesus' resurrection because it just hits too close to home. We've created a scene in our minds that I believe is far too clean-cut. No scars. No damage. No reminders of what was. We picture a clean-cut Jesus, standing in our midst, without any remembrance of what He lived through. But instead, what we read in Scripture is a man Who literally is bearing the scars of His death and willing to show to the world that He rose again from this brutal death. And He lives to tell about it! So, as a precursor, I hope you see that we need to re-look at this scene with new eyes. We need to risk looking at this scene without our preconceived ideas of what we'd want Jesus to appear like and see what really happened. In Jesus' 'resurrected state scenes' we read about, in some ways they are all very similar. Generally speaking, in His appearances He chose to reveal Himself so people would know Who He was. Yet please note that Scripture tells us that it was through His scars that He revealed Himself. To prove, comfort and heal His followers that He was Who He said He was, He revealed His scars to them (Jn. 20:20). I'll write more about what I believe the implications for us today in a moment. Thomas waited eight days for Jesus to reveal Himself. I'm sure there was a lot of stewing going on in his mind. How would Jesus come? Would He come at all? Would He grant his request or chastise him for asking for something so ludicrous? Would His scars still be bloody? What would they feel like? I believe his request wasn't all that far-fetched as, as I have already mentioned, Jesus revealed His scars to others, so all Thomas was asking was to physically touch the scars that Jesus was already willing to show. I believe Thomas caught something and dared to do something that far too few of us do - Thomas risked because he knew the heart of Jesus; the Saviour who doesn't chastise or condemn. Jesus willingly meets us and willingly reveals Himself to us without condemnation. I would even go as far as to say that even when we're in our most vulnerable or doubting state, He still desires to reveal Himself to us. It doesn't matter our faith-metre. It doesn't matter how little we believe in Him. It doesn't even matter if we're asking Him to do something that others would say is ludicrous. Instead of Thomas the Doubter, I'd like to call him Thomas the Risk(er). And I'd like to learn from him. I must confess that I would have yearned for this opportunity. Faith is a little too abstract for me these days. I long for tactile. I long to touch what I believe. But for the most part, I feel I've been asked just to believe without seeing because Jesus clearly says, 'Blessed are those who believe without seeing'. But the reality is there is no condemnation when we truly, with a pure heart, seek out answers and risk asking the questions that few dare to ask. I'm a lot like Thomas. He was given the opportunity to touch Jesus because He thought that was what he needed to believe. But it's very interesting to me that he actually didn't act on his words. That's right! You read right! Thomas doesn't touch Jesus. Read it again. Verse 28 of John Chapter 20 does not say that Thomas felt Jesus' scars. I'm thankful for the organisers of the Scriptures who chose to highlight Thomas' response so it's the only thing in the verse. But we still miss it. 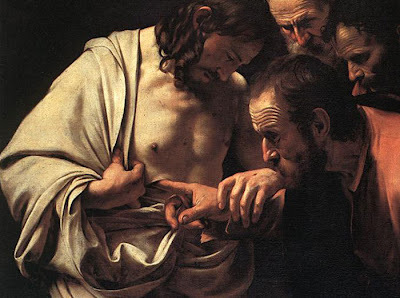 Thomas' request to actively put his finger in the nail marks on Jesus' hands and to reach out and slide his hand in Jesus' side were not done. Though he asked to do these things, he doesn't do them. I believe if he did actually do this, John would have wrote it. But John didn't write it because I believe Thomas didn't do it. All Thomas did was exclaim, 'My Lord and my God!' I believe he was so struck with Jesus' willingness to appear to Thomas in such a vulnerable state, he was cut to the core with his own (mis)belief and mistrust. All he could do was confess that Jesus was his Lord. And in doing so I believe he began to understand something of the mystery that I am attempting to flesh out here - the mystery (and glory) of scars. So let's turn the corner. For the remainder of this post, I'm going to focus on the Scars of Jesus, their healing properties and what, I believe, Jesus wants us to learn in response to His example of revealing His scars. There's something very mysterious about scars. I once heard a quote that addresses it well: Scars are reminders of what we've lived through. If this is true, why don't we reveal them more? Why aren't we celebrating what we've been through? Why are they things that we hide? Think of all the healing that we could give to the world (and ourselves) if we risked showing our scars, the things we've lived through and learned from! From the woman who's had surgery to the model who is fired because she has them to mankind's reaction to scars, I really believe we need to re-shape our philosophy of scars. Scars tell stories. If we continue to hide them, I believe we're dishonouring the true and life-giving hope that they bring to us and those around us. I believe we are missing out on many, many blessings, both for ourselves and our loved-ones. But the sad state is, I think it's mostly our pride. I believe we don't reveal our scars because it's too difficult for us to be reminded of the things that we think are of no value. We don't see these circumstances as something that can bring blessing. And so we hide. Hide from God. Hide from people. Hide from ourselves. By contrast, when Jesus revealed His scars, it brought confirmation to His followers. So...track with me now...if Jesus' scars brought confirmation of Who He was, I believe with all my heart that Jesus desires us to show our scars so we can continue to confirm Who He is. If we have welcomed Him into our daily life experiences, He will use us to reveal Himself to many through the scars that we willingly bear - and it will be for His glory. You might have a story in your past that you don't feel you can risk exposing. You might have a physical scar reminding you of a stupid mistake. You might have an emotional scar that is just too difficult to bring back to life. I don't deny the risky vulnerability. When I've shared my scars with people, I've risked their reactions. I know what the Lord is asking me to do - turn the shoulder so people see Him and not me when I tell my story. I would love to tell you that the reactions are good and hospitable across the board, but they aren't. I wish I could tell you that in revealing my scars it has drawn me closer to people, but instead, it has brought distance; not to everyone, but most. This isn't unlike Jesus. He was vulnerable. He risked. But many disowned Him. In fact His whole core group of friends disowned Him. But I will say, though, that in willingly exposing my scars, it has brought me closer - to a very few people - but I'm not after quantity, I'm after quality. And it has brought me closer to the Lord. My perspective is people, generally speaking, don't know what to do with me because of the scars that may remind them of their own - and it's hard for us to be in each other's presence. But if we let them, our scars will bring healing, on a level that neither of us have ever experienced. When I think back to the experience with Thomas and Jesus, Thomas was never the same again. And neither were any of the others that Jesus revealed Himself to. We should be the same. Because of Jesus' scars, we are healed. I believe He wasn't just doing an act, but intentionally giving us an example of vulnerability for us to follow. So...go ahead, show your scars. Risk vulnerability. Erect a purpose for the scars that you have hidden. You'll be glad you did. So here we come to the last sentence, the last line of the Book of Jonah, and it ends with a question. It's curious isn't it? We have an incredible story here but I don't think any of us would end our stories with an unanswerable question. But by God's Providence, this is where we end...or do we? We read of a man who fled (or tried to flee) from the LORD and was spared from drowning by being swallowed by a fish. Jonah repents inside the belly of the fish to be vomited on land shortly thereafter. He hears the voice of the LORD for a second time to share a message to the people of Nineveh, but this time he obeys and shares a very simple statement to the people of Nineveh and there is a great revival. Yet, instead of seeing this great fruit, he still harbours resentment in his heart for these people - there are still many lessons Jonah needs to learn and we, yet again, see the spotlight on a gracious, merciful God who desires compassion (and relents His destruction). This clearly is confusing to Jonah and so he needs to hear from the LORD...again - just like us. Isn't this the point of our lives? Isn't this the one thing that the LORD desires us to wrestle with? How on earth do we contend with a God Who, at first, clearly communicates that He will wipe out a whole city and then, because of compassion, of all things, relents!? I believe the point of the Book of Jonah is to learn the LORD's compassion for His people doesn't make sense, but is worth learning how to imitate. How would you or I answer this question if the LORD were to ask it of us today? 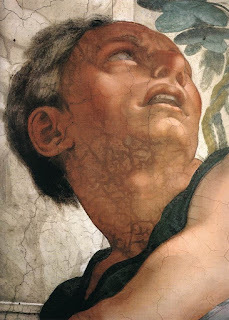 Maybe we too have the same issues as Jonah - maybe we too believe that we should just sit under a tree and watch the unfolding of the LORD's judgement on the world. May I encourage you to read through the Book of Jonah (again) and seek out the LORD of Compassion who does not wish any to perish but for all to come to repentance (see 2 Peter 3:9). The main character of The Book of Jonah has always been the LORD. Yet, in being the main character in a performance, they wave their hand across the stage where their fellow actors and actresses bow during the audience applause, because they know they could not have done it alone. Yes, the LORD is different. 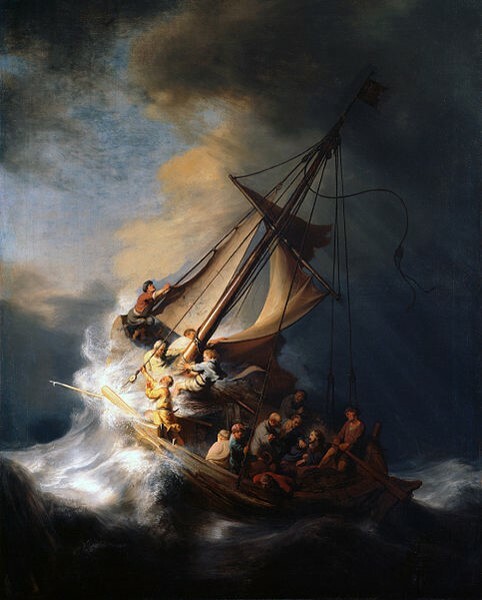 He could have chosen to do all these things alone - without Jonah - but He sought after him...unrelenting. The LORD could have done all the work Himself, but He condescends Himself so others could receive great benefit of knowing His heart and sharing His heart with others. So how will you answer this question if the LORD asked you today? Should I not have compassion on [ ]...? Fill in the blank... answer the question for your life today serving the LORD. And watch Him work and the great compassion He chooses to bestow on all Who wish to have Him in their lives! Jonah had every reason to be happy. He had been rescued from the inside of a great fish, given a second-chance to share the good news to people who needed to hear it from a Holy God Who had every right to leave him in the fish to die. Further, even though it seems he half-heartedly gives a sermon to the great city of Nineveh, his few words birth a great revival in the city. He has 'fruits of his labour' right in front of him, but he isn't happy. Why? Then Jonah went out from the city and sat east of it (vs. 5). No, he hadn't run as far as the direction of Tarshish, but picture this scene. There is revival in the city. Most likely he could hear the commotion inside the city. Jonah could have had numerous opportunities to teach more truth of Who the True, Living LORD is - but instead he flees and sits under a tree. He can still see the city from where he's sitting - but he's definitely desiring to be a spectator. And yet, in walks the Main Character of the book of Jonah. It's incredible to me how patient and understanding the LORD is. I can see Jonah loosing his temper a number of times, and yet the LORD simply, yet firmly, shares truth, yet again, with Jonah. The LORD truly is an ever-present help and consistently comes along-side Jonah; maybe some of the lessons are hard, but the LORD is certainly consistent. Providence & Patience. Pardon. Power. Pity. These are the themes of this book. These are the characteristics of a Holy God that Jonah needs to learn (and re-learn). These are the lessons we all need to learn! It will take much more conversation for Jonah to really come face to face with his own desire to live a holy life as the LORD calls him to live, but we don't have those conversations. The book seems to end quite abruptly. Click the picture above to follow along and discover for the first time, or read it with fresh eyes, The Story of Jonah. Discover the Grace of our LORD like no other. Discover again, or for the first time, the Sovereignty of God in the Story of Joseph. Click the picture above to begin a verse-by-verse, chapter-by-chapter dialogue of Joseph's Story of God's Faithfulness. 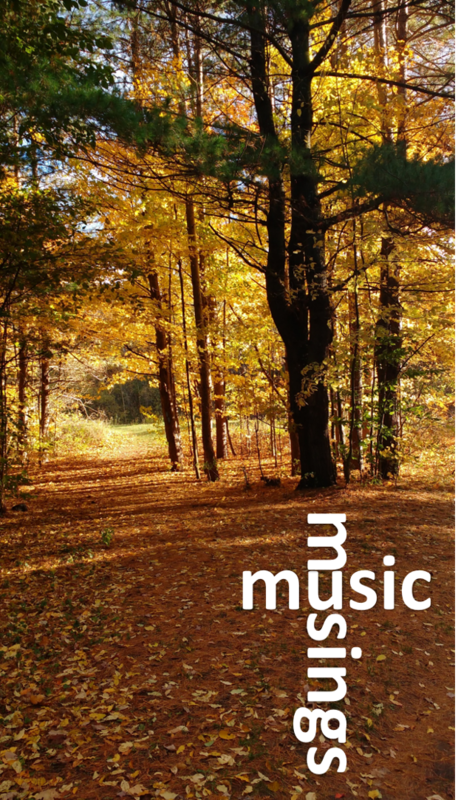 Click the picture above to read the Stories behind the Songs the LORD has given me, for His Honour. For His Praise.